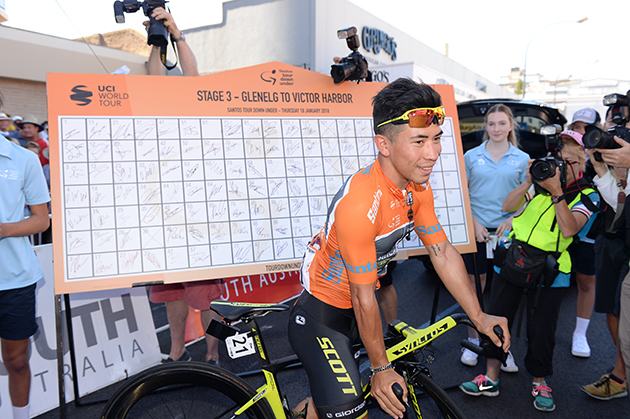 Lotto Soudal is thrilled to announce the signing of Caleb Ewan. The 24-year-young Australian makes the move from Mitchelton-Scott and signed a two-year contract. Sports manager Marc Sergeant is of course delighted that Lotto Soudal managed to sign Caleb Ewan. Turned pro at Orica-Greenedge in 2015. We posted the report from winner Michal Kwiatkowski with the stage results. 8 August, 2018, Bielsko-Biala (POL): Dylan Teuns came agonisingly close to victory on stage 5 of the Tour de Pologne, in an uphill battle against race leader Michal Kwiatkowski (Team Sky) which saw the Belgian just fall short of the win. It was a fight to make the breakaway with multiple attempts brought back before seven riders managed to go clear after 15km of the 152km stage. The peloton kept the breakaway to within 2'30" for the whole stage and slowly began to bring them back over the two category two climbs. A fast pace set on the only category one climb of the day saw the remaining four breakaway riders' advantage reduced to one minute and as the race entered the finish circuit, three laps of a 7.2km course, the breakaway was just 20 seconds in front. Teuns was well-positioned at the front of the bunch as the peloton navigated the fast circuit and made the catch with two laps remaining. Teuns was glued to Kwiatkowski's wheel in the top ten positions on the final lap and was in the perfect position to launch his sprint in the final 300 meters. Although he was forced to brake momentarily when almost touching wheels with Kwiatkowski, Teuns was able to regain momentum and launch his sprint. 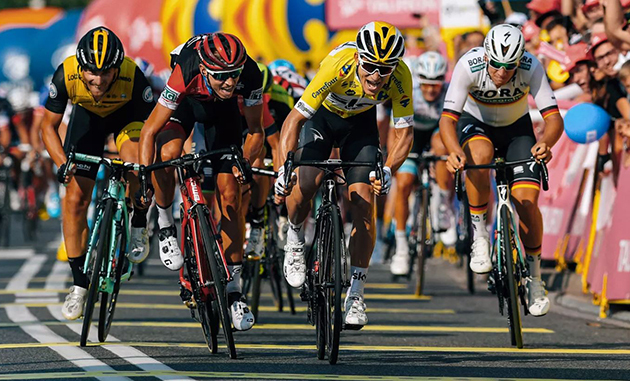 Teuns battled to the line but was unable to overtake Kwiatkowski and was forced to settle for second place for the second consecutive day, which strengthens Teuns' second place on the General Classification, 12 seconds behind Kwiatkowski, with two stages remaining. Michal Kwiatkowski is the fastest man of the day in Poland. "It was not the hardest stage of the four climbing stages but it was still tough in the final. It was Mitchelton-SCOTT who increased the pace in the last 50km so it started to get a little nervous. We knew that the sprint could be dangerous for splits and the potential to lose time. I was in a perfect position. I was very well-placed in the last 3 to 4km and I could stay there. I came into the sprint and did my own race but with 300m to go, I was almost touching the wheel in front of me. I didn't expect that and I lost some speed as I had to change position but in the end, I think I did a really good sprint. I didn't lose time and that was the main thing for today." "I only lost by one wheel so it feels like a missed chance because I was still really fast and I had a chance to beat him [Kwiatkowski] but it didn't work out so congrats to Kwiato. The main objective is still the General Classification. Both of the next two stages are important and tough but I am in a good place. I am a former winner so I want to give everything to be on the podium on Friday." The fifth stage at the Tour de Pologne saw a seven rider breakaway which lasted until the last climb of the day. As the race headed into the final laps, BORA – hansgrohe focused their final to ride for their sprinter, Pascal Ackermann, who went on the attack sprinting to fourth place surrounded by the GC contenders. Today’s 152km long route from the famous salt mine “Wieliczka”, which is an UNESCO World Heritage Site, to Bielsko – Biala consisted of three climbs (2 Cat.2 and 1 Cat.1) and two intermediate sprints, all happened it the second part of the route. It was another day anticipated to be a relatively decisive day in the race for the GC. After studying the course profile, the BORA – hansgrohe team decided to focus on delivering Pascal Ackermann in the finale to try for another stage win. However, the teams main focus was to regain sprint jersey on Pascal’s shoulders so minor placings were an equal target. After one hour of constant attacking by the peloton, a group of seven riders formed ahead of the first climb of the day. Team Sky took control over the pace in the main field, and with the gap dropping steadily, it was nearly all back together with 30km to go. The last three riders were caught as the peloton came into the final laps in the city of Bielsko – Biala. The BORA – hansgrohe train showed once again a strong team effort and started to form their lead- out for the German Champion Pascal Ackermann. 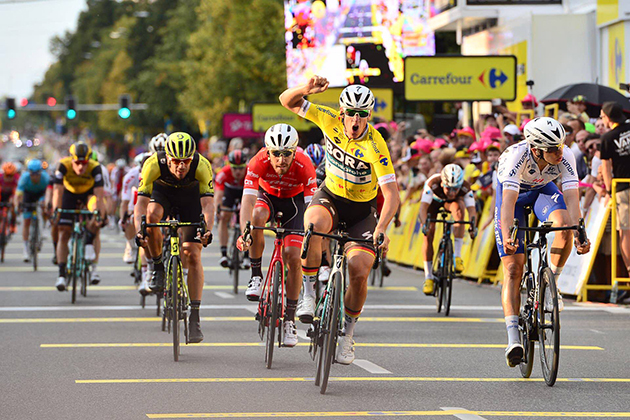 As approaching the finale, all favourites were at the front of the race, as well as BORA – hansgrohe sprinter Pascal Ackermann. Surrounded by some GC contenders, the German Champion sprints to fourth place to regain the sprint jersey. It was again M. Kwiatkowski who celebrated his second consecutive victory, while Emanuel Buchmann sits ninth in the overall. Team Sunweb's Ellen van Dijk (NED) has won the European time trial championships in Glasgow today, securing her third title in as many years. The 31-year-old specialist completed the course in a time of 41 minutes and 39 seconds, taking the victory by a margin of two seconds. Van Dijk said: "I’m really happy to prolong my title for another year. It was a nice rolling course, always going up or down a bit and I felt good, but I wasn’t very confident on the wet corners which cost me some time in the final part of the race. At the end it was a very close finish with Anna van der Breggen. I’m happy with my performance and proud to be able to wear the Euro colours for another year." Team Sunweb coach Hans Timmermans (NED) said: "Ellen shows again today that she is one of the best TT riders in the world. After her wins earlier this season at the Thüringen TT and Dutch championships, she now successfully defends her European title. After this great performance she can look forward to the world championships with confidence." 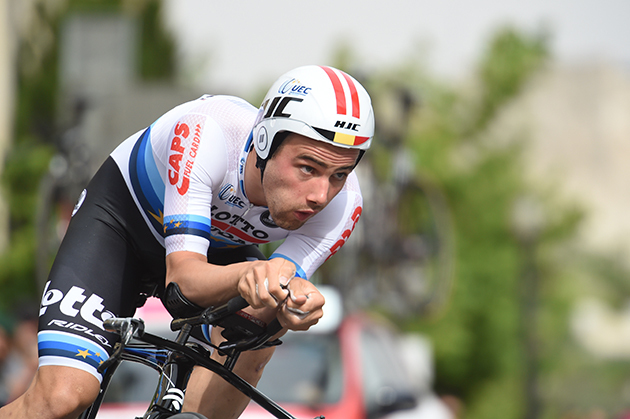 Lotto Soudal rider Victor Campenaerts was determined to prolong his European time trial title. 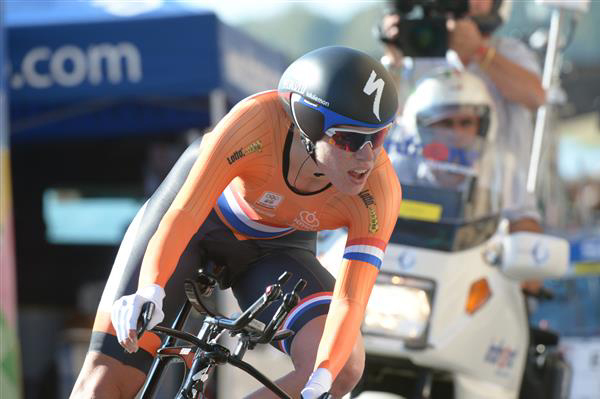 The Belgian and national time trial champion kept things interesting till the very last moment, and eventually proved to be the fastest European for the second time in a row. With a time of 53’38”78 on a course of 45.7 kilometres, Campenaerts kept the Spaniard Castroviejo from winning with just 63 hundredths of a second. The defending European champion clocked a tenth best time at the first checkpoint, which was 19 seconds slower than compatriot and fastest man at the first intermediate time split, Yves Lampaert. Campenaerts accelerated and left - despite the heavy rainfall in the final kilometres - all of the other competitors behind him. Victor Campenaerts racing in the Giro earlier this year. Sirotti photo.